Check out Capcom's upcoming DS title in action! 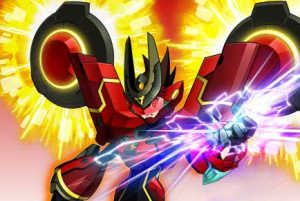 Mega Man Star Force 3 will be released on the DS in two different variations: Red Joker and Black Ace. Each version of the game will have its own distinct cover art and character transformations. Capcom has just recently released the official Boss Trailer showing one of the game's many boss fights in action that you can check out below. You can also download the DS demo of the game on the Nintendo Channel for a limited time. The game is set to be released in the US on June 30th. We'll have more information on Mega Man Star Force 3 as it becomes available, as well as a full review when the game is released. ...as do I... also, I don't like how more and more games are being made with two seperate versions with minor differences. I haven't tried out this Star Force series yet. Maybe at some point, but I'm a big fan of the regular Mega Man titles, so it probably wouldn't appeal to me much. But you never know. I played the demo on the Nintendo Channel, it was pretty fun. I played the demo too--it was decent. I have the first Star Force game and its okay. I played the demo on the Nintendo channel and it seems better than the original. Is there going to be a review of this game on Nintendo Life? CAPCOM!!!! NO ONE SHOWS THE FINAL BOSS IN A OFFICIAL TRAILER!!!! yeah and i am saddened by that. i enjoy the main pokemon games. Despite naming myself after three Megaman series characters, I have gone quite off the recent Megaman series especially on the handhelds (aside from the PSP ones of course). Megaman playing DDR in a Viking helmet? Pass. I love the StarForce series. Can't wait for this one! I've followed the Mega Man series since I was born. @Corbie: Start with Battle Network 1 and 2. @SD28821 - way to use the incorrect 'there' while trying to call someone else dumb. You get a high-five with a feces-filled hand. For the record, Starforce is actually a lot of fun and the music owns....MMBN series music started tanking pretty hard towards the end (starting with 4), but the DS hardware seemed to revitalize things. And hello again everyone! Took a couple weeks off of NLife due to my computer contracting electro-AIDS. I have since cured it. Please don't tell me took it in to the computer repairman. I'm definitely going to check this one out. Is that really the final boss in the video? I sure hope it isn't. That would be a major spoiler. At the start of the video you can see the words 'Last Battle' on the screen for a short time.